For the ultimate combination of lifting power and portable convenience, there's no besting the BL-7000SLX. Light trucks and SUVs are easily supported with this reinforced frame design. If you want to see true power in action, you need to see the BL-7000SLX lift a Chevy pickup in only 30 short seconds. It's not just that QuickJack gets trucks in the air quickly that impresses virtually everyone, it's how stable, how fast and how smooth QuickJack works. In order to eliminate obstructing cross bars seen on other lifts, this fully electric-hydraulic system is demandingly engineered with reinforced steel frames, as well as a built-in flow restrictor to regulate the pressure output of each frame's cylinder. The end result is unprecedented portable lifting perfection. This lift is the "big brother" in the SLX series. It's a little thicker in its collapsed position, which means it sits a mere 3.5" inches off the ground. For reference, you can slide these frames under your Miata and safely lift it. That's just how low-profile it is. The frames, despite being the largest in the SLX series, are still easy to roll and stow in tight spaces. We highly recommend the optional truck adapter set, which offers extra lifting height for high-clearance vehicles. 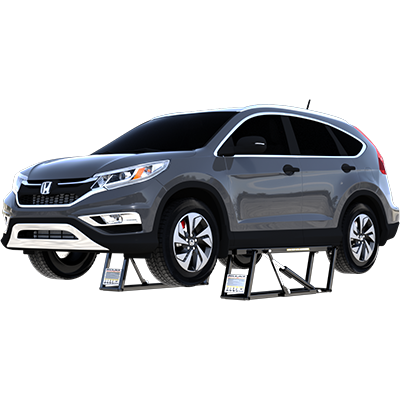 If you're using this model to lift both big trucks and small cars, meaning you need QuickJack to accommodate a wide range of wheelbases, you'll also want to pick up our removable frame extension adapter kit. The adapter requires zero installation and easily supports up to 7,000 lbs., expanding QuickJack's lift point spread a full 6". The BL-7000SLX is our highest-capacity standard length ​lift. If you need longer frames, we also make EXT (extended-length) lifts in 2,268 and ​3,175-​kg. capacities. With QuickJack, it's never been easier to put the perfect car ​lift in your home or shop.